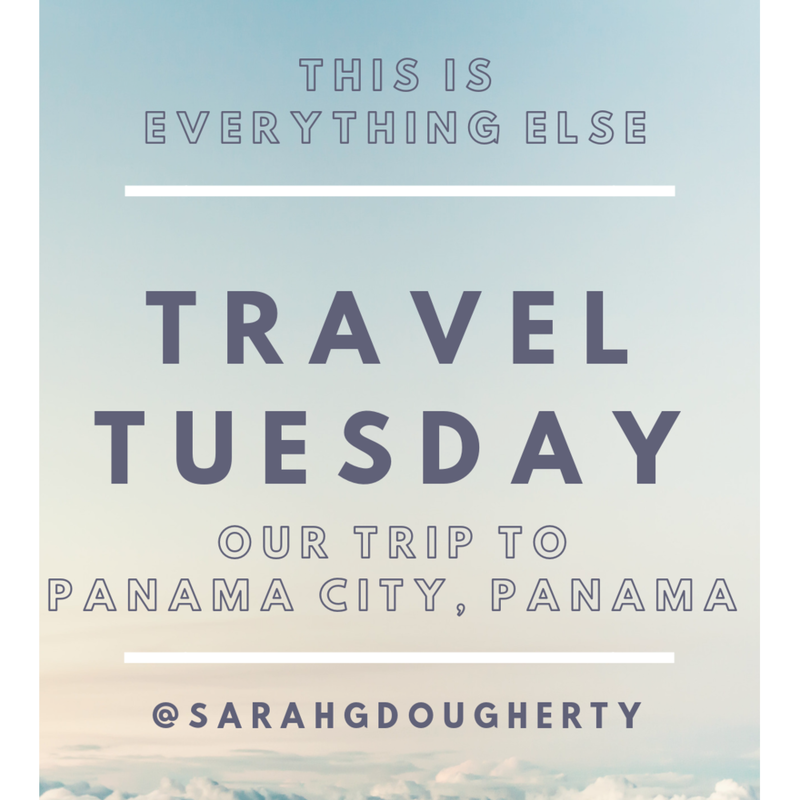 Jan 8 Travel Tuesday: Panama! This Thanksgiving my family called an audible and spent some time together in Panama City, Panama and Cartagena, Colombia. I loved getting to unplug, see new things and eat alllll the fresh seafood and fruit. (Somehow fish from the Hudson don’t taste that good…) Sharing our itinerary/recommendations for Panama today! Because New York is the city that can’t seem to bounce back from pouring rain or snow, I woke up to a cancelled flight and scrambled to JFK because the app was down and the phone wait was two hours. (A serious scramble… no shower, miss-matched clothes, unsure of which ‘last-minute’ packing items I’d managed to throw into my suitcase, a $150 Lyft, etc.) I was re-routed and had to connect twice for any chance of making the flight from Atlanta to Panama City with my family (s/o to the sweet Delta agent who helped me and was nice even though the help line was at least 30 people long.) Had a little sprint in the Atlanta airport but – YAY – made it. Saturday was our ‘essentials’ day – Canal and Biodiversity museum. Honestly, I was really indifferent about the canal/locks system going into the trip, but after learning more and seeing it first-hand, it was awesome. Also, it’s insane thinking about how much we consume travels through the Panama Canal to arrive in NYC grocery stores. The history and engineering of it proved fascinating in the end. After our trip, Granny told us that our grandfather had traveled through the canal when he was in the Navy, en route to the South Pacific. Also cool. We did the combined tickets for Miraflores Canal Visitors Center and the Biomuseo, which worked well because we could do the museum and return to Miraflores in time for the day’s ships to go through the locks. I loved the Biomuseo – the people were so friendly and helped add context to the exhibits, and the AP Environmental Science class I took in high school suddenly became relevant again. For such a geographically small country, the biodiversity is incredible; the way the movement of land impacted species and the rainforest to form what is now Panama was something I hadn’t previously considered. And, as many things do these days, the museum made us realize the number of species that are going extinct because of invasive species, human impact/construction and climate change. The building itself is cool, too – designed by Frank Gehry, it’s indoor/outdoor and brightly colored, right along the coast. Biodiversity, color-coded based on its current state - extinct, protected, thriving, etc. I shared a video on Twitter, too. Honestly became way too caught up in this entire thing. Saturday was the day we learned why friends and people on the internet highly recommended using Uber in Panama… taxis were 4x as expensive and half the size. Instead of $6 for the 5 of us to sit in seats, we paid $20 for us to squeeze into a small sedan. (Uncomfortable but hilarious.) Using Uber also helps to make sure you’re headed in the right direction because the address system is really hard to follow. Sunday we had an early wakeup call and got picked up at 6 a.m. sharp. We drove about 40 minutes out to the rainforest at Gamboa, where we ended up in a park ranger’s pick-up truck driving into the middle of the forest. Then we walked to the center and climbed the canopy tower, where we did some bird-watching, saw a few sloths (!!) and a toucan that looked just like the fruit loops mascot. (I don’t have a fancy camera, so no great wildlife pics.) From there, we hiked around to different areas, saw a lake and more crazy-looking animals and headed back to the truck. 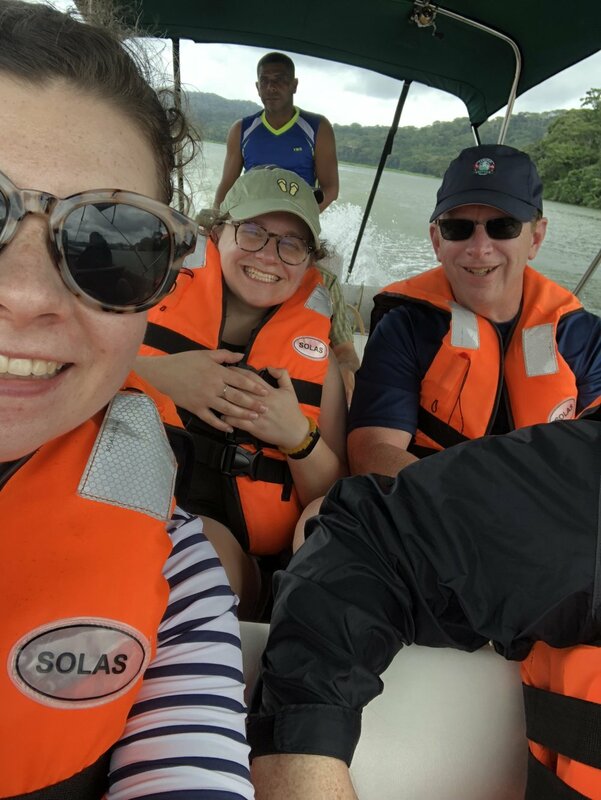 From Gamboa, we went over to Lake Gatun, which was built for canal purposes. We got on a boat and went around to what they called ‘monkey island,’ where there were, in fact, monkeys! Our guide also spotted a baby crocodile, and I swear my family will always be baffled by how he was able to find it from 25 feet away; the thing was tiny and completely camouflaged. It started sprinkling, so we pulled the boat over and enjoyed some ham sammies and the best pineapple I have ever consumed in my life. On our drive back to the hotel from Gatun, there were sloths just chilling in trees on the side of the road. It was great. Additionally, we got stuck in the elevator and had to climb and jump out of it. That night we just showered and hung out, and managed to find an NFL game on FOX Deportes. 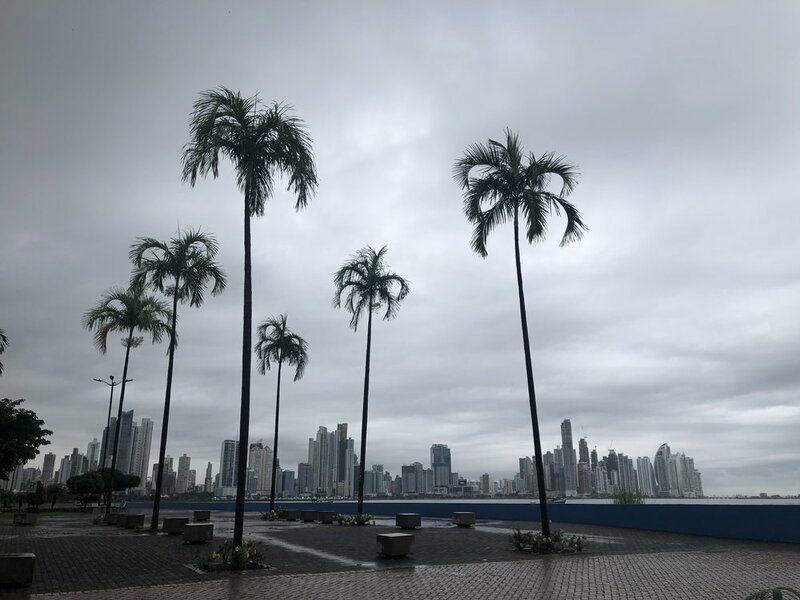 This was our last day in Panama, and of course, our luck of dodging the end of rainy season weather had run its course. We grabbed our umbrellas and wandered around the old city, Casco Viejo. It’s a designated World Heritage Site, and was being updated/restored while we were there because the Pope is visiting in January! There was a lot of construction happening all over Panama City to accommodate his visit. It was smaller than I’d imagined; I think I’d pictured it more like Cartagena, where it was larger but more self-contained. We did almost a full walking tour of the area in ~3 hours. When the rain became a swift downpour, we took refuge in a market, where my sister and I bargained like crazy. We were proud of our brother because he bargained to not have to pay to use the restroom there (they were charging $2!) in Spanish. Small victories. Then we wandered to the ‘flat arch’ that supposedly convinced the American senate to build the canal in Panama instead of Guatemala. They allegedly used the arch to display the area’s stable weather/plate movement. We moseyed back out into the rain, heading toward the fish market. The fish market itself was just like a normal place where you stop and pick out fish; the restaurant side is where they get you. All of these different salesmen are trying to pitch their fish to you, with deals like a free beer (cerveza!) or ceviche. We met a nice guy from Venezuela, and had some of the best shrimp ceviche and fried fish (with yuca fries!) I’ve ever had. For dinner on Monday we went to a local steakhouse and then went back to the hotel to pack and prep for our trip to Cartagena, Colombia on Tuesday morning. 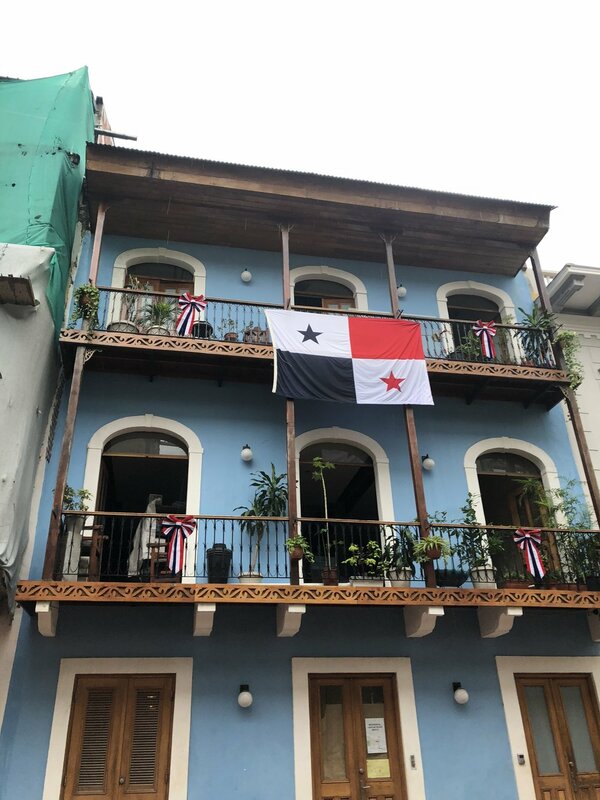 We had a great time in Panama and exploring – the canal was interesting and a must-see, and the rainforest and Casco Viejo were great spots. I probably wouldn’t be in a rush to return, just because we hit the big items for the most part. It was a great place to kick off our trip! Jan 29 Travel Tuesday: Cartagena!